Continuing on a theme of extinct animals that can be resurrected or reinvented in fantasy novels (or even historical novels), one great source for interesting species is islands. So many species from the mainland traveled somehow to islands, became separated from the source species, and evolved down an entirely different pathway, becoming much larger or smaller and/or filling an entirely different evolutionary niche. 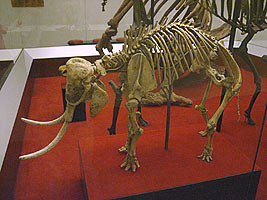 An example is the dwarf elephant. Over the course of history, elephants have colonized islands of the Mediterranean, Southeast Asia, and even California! In all cases, the elephants became dwarfed–dramatically so. Each species was different, but the Cyprus Island dwarf elephant weighed in at about 450 lbs, similar to a Shetland Pony. Think for a moment about an elephant the size of a Shetland Pony. CUTE! And elephants can be domesticated, sort of. Can you imagine a dwarf elephant pulling a pony cart? Maybe acting as a pack animal, in place of a donkey? Only it backfired on me a little. The elephant was so popular that when I didn’t have any followup scenes with him, some of my beta readers complained! So I had to try to create more of a role for him. This entry was posted in Fantasy, History, Writing and tagged dwarf elephant, evolution, fantasy, flood and fire, history, islands, writing. Bookmark the permalink. I love the elephant;-) You write him very cute. You’ve got me wondering how I could work a dwarf elephant into my WIP, Amy. I once saw a baby buffalo at the New Orelans zoo, about the same size, and adorable. Awesome 🙂 It’s funny how much a writer can do with just taking an existing animal and modifying a single thing about it (like its size). LOL. That’s awesome. What a great problem to have, your beta readers demanding more of your creation. Thanks :). Although sometimes they drive my story in inconvenient directions!